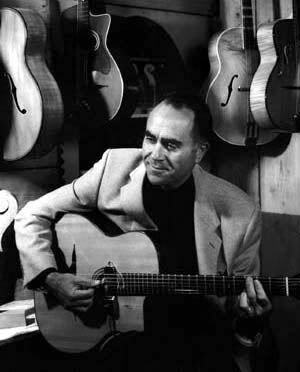 During the 1960s, Philippe Nedjar was one of the rising stars of the Parisian Gypsy jazz scene. Although a non-Gypsy from a Sephardic Jewish family, he excelled at the music of Django Reinhardt. Nedjar’s knowledge and proficiency in the traditional Django style earned him the respect of the upper echelon of Gypsy musicians. He performed with Babik Reinhardt, Jacques Montagne, Tchan Tchou Vidal, and Stephane Grappelli. He appeared at the Samois-sur-Seine Django Reinhardt festival in 1968. This audio clip was recorded live in 1969. It demonstrates his purist approach to Django’s music. By the early 1970s Nedjar had grown weary of the life of a professional musician. The story goes that one night he choose a medium tempo song to end the set. His accompanists suggested that they play the song faster since they were only being paid to play for two more minutes. His sense of musical integrity was deeply offended by such a suggestion. He was there to create art, but his accompanists where just punching the clock. This incident was a watershed event for him. It symbolized his frustration with the difficulties of trying to make it as a musician. Shortly thereafter, he ended his career as a professional guitarist and entered the family business. On this CD, Nedjar’s Gypsy side comes out most strongly in his remarkable performance of Django’s 7 minute long unaccompanied solo version of Nuages. This audio clip was recorded live at the Samois-sur-Seine festival in 2004. It shows his incredible evolution from a Django purist to a sophisticated bebop improviser. This performance of The Night has a Thousand Eye was clearly inspired by John Coltrane’s 1960 recording. Posted by Michael Horowitz on November 1, 2005 at 7:56 pm in Audio.